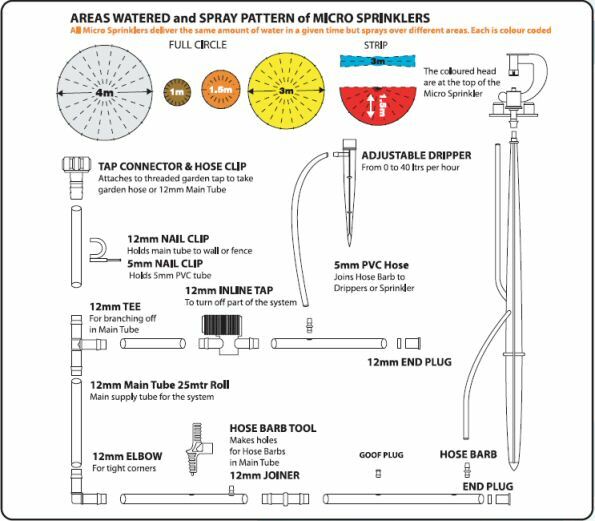 All Micro Sprinklers deliver the same amount of water in a given time but sprays over different areas. Each is colour coded. The colour refers to the spray head on the top of each sprinkler. Only one garden or greenhouse tap? Want to run a watering or mist system and a hose? Screwed onto your tap, this brass valve stops back siphoning and hence contamination from a hose into the supply. Complies with the Water Industry Act 1991 & Water Byelaws. Micro Misters produce a rain like spray. 5mm Hose to Tank Connector 1/2"